Circuit de la Grange - easy hike in a winter wonderland - Life is a lucky bag! The hiking trail "Circuit de la Grange" is located in the French Alps, close to the village Manigod. 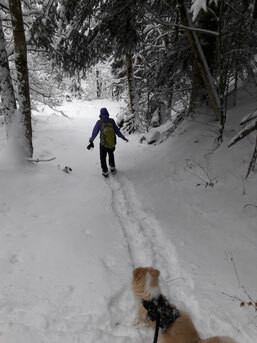 The hike is short, but takes you through a beautiful winter wonderland. 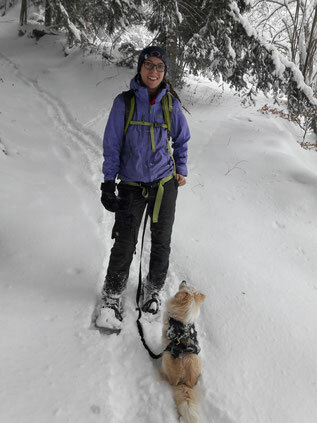 About 6,7km well-marked snowshoeing trails make it a lovely day-hike - even for beginners. Otherwise I would recommend to bring the typical things for a winter hike: headband/beanie, warm gloves, hiking sticks (can be reallyuseful! 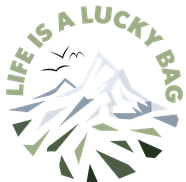 ), warm clothes, maybe a bottle of tea, some snacks, first-aid-kit etc. Start the hike in Villard-Dessous a bit outside of Manigod and follow the well-marked (snowshoe-)trail slightly uphill through the forest to "Froide Pierre". Now the trail will take you up- and downhill mainly through forest and along small forest streets until you reach Manigod. In Manigod itself you find a few restaurants and bakeries - so you have some good choices to refresh before you head back along the same route.